The ever popular 1/12 scale R/C Midnight Pumpkin is now available as a special Black Edition model, featuring a stylish Black ABS molded body. The R/C Midnight Pumpkin (first released in 1987) was loved for its camp appearance as much as for its R/C performance. 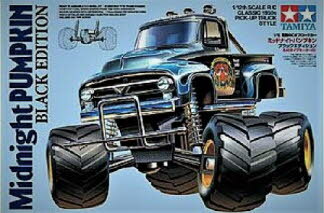 The 1950's style U.S. style pick-up truck body is raised up over the monster truck wheels to ensure that this R/C truck will get attention anywhere you choose to drive it.